Clare McKinney knows the challenge of preparing students for their futures. She hopes a recent trip to Yellowstone National Park helps her and four teachers at Lafayette's Jefferson High School do just that. "How can we, as educators, encourage and provide opportunities for children so that they may speak in a ‘calm, confident voice' about issues they care about?...How can we, as educators, provide our students with experience beyond the walls of the classroom that will allow them to determine their ‘calling' in such a significant way that they forever experience the feeling of fulfillment?" the assistant principal posed in her journal. "It is my hope, as an educator, that Yellowstone, with its vast resources, tamed and untamed, will better prepare me to meet that challenge." Yellowstone stands at the center of multiple controversies concerning buffalo, wolves, winter recreation and other issues. Indiana State University professors lead a class of Indiana teachers that investigates democracy in action at Yellowstone where factions, opinions and groups collide in trying to determine what is best for the nation's first national park. "The goal is to help our students to better understand democracy and really the participatory nature of democracy," said John Conant, Indiana State economics chair and leader of the Democracy in Action class. Class members witness those collisions in democracy through face-to-face conversations with various stakeholders who talk about what they're fighting for. Conant describes Yellowstone as a classroom in itself. ""Yellowstone National Park provides not only a really interesting, fun environment, but a real-world place that you can study the economic concepts as they are working themselves out, particularly through a public discourse and decision making over how these public assets should be used," he said. McKinney agreed that Yellowstone holds many valuable lessons that can then be applied locally. "I recognized the value of experiential learning through interdisciplinary teams and this project provided the opportunity to provide that type of professional development for my staff," McKinney said. Through studying Yellowstone, teachers can discuss with their students land use, public domain, freedom of expression, the power of persuasion and how to critically assess information. They also learn how to apply lessons learned with Yellowstone to local issues such as water quality and control of the Wabash River from the water wars in the west or bison versus ranchers and whitetail deer versus farmers or bioprospecting and biofuels. The end result, they hope, are students who become actively involved with local issues. "The Yellowstone National Park issues occur everywhere to varying degrees," she said. "Relevance is key to student learning and Yellowstone carries some level of significance in a student's prior base knowledge." By bringing lessons learned in Yellowstone home, the teachers can transfer more than facts to students. "Students are learning content that will be obsolete by the time they enter college," McKinney said. "It is important to provide them with a skill set that will allow them to continually adapt what they know to be true as they gain new knowledge. Their world is so much more dynamic than the world we experienced as students." One aspect of student learning is working toward answers of questions such as "Once we manage wildlife can it still be considered wild?" "These types of open-ended questions present students with opportunities to research, sift through propaganda and ‘factual' fiction and formulate a defendable opinion of their own," she wrote in her journal. "That is how learning becomes real." McKinney also encourages teachers to ask children "What is your best idea?" in following documentary director Ken Burns' declaration of the national park's as America's best idea. "We do not encourage students to put forth their best idea when it comes to national and global issues," she said. "It is not enough to become aware of or to be able to identify a problem. Our kids must be able to formulate solutions, or come up with their ‘best idea.' We have to push them to do just that." John Conant, Indiana State University economics chair, at 812-237-2160 or jconant@isugw.indstate.edu. 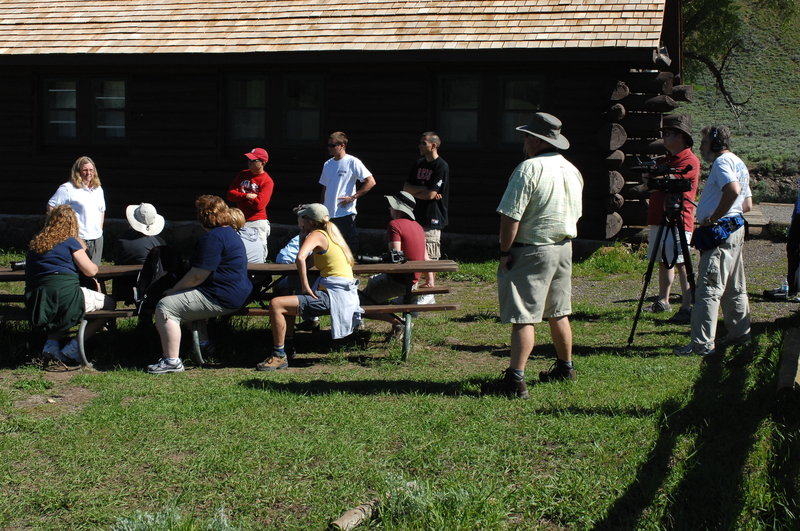 Indiana State University professors lead a class of Indiana teachers that investigates democracy in action at Yellowstone where factions, opinions and groups collide in trying to determine what is best for the nation's first national park.